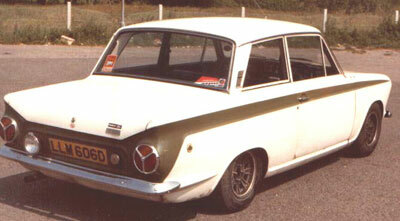 Here are 2 pics that you asked for, of my old '66 Lotus Cortina - LLM 606D. I bought it in the early '70s when I met Ronnie Peterson's mechanic at a race meeting, and he mentioned he had one for sale. I drove down from my home in North Wales to his near Bristol to collect the car - it took 2 tankfuls of petrol (which would be about 18 mpg) to get back home! I had a local twin cam specialist set the car up (twin webers were a nightmare) and the fuel consumption improved dramatically - so did the performance! It was a 'flying machine' and sounded lovely - people used to come around to the house just to hear it fire up! My wife and I drove from Chester to Gatwick Airport (only 250 miles) to fly out to Africa - I had to refuel twice - and carry a gallon of Castrol GTX oil with me! 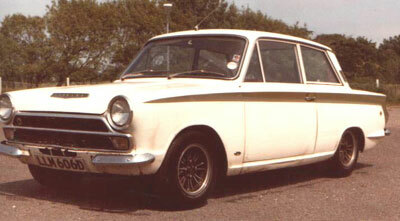 Later, a local garage that raced twin cam Escorts rebuilt the engine for me - and it was great again. By this time (1974), I had a little daughter, so I sold the Lotus (reluctantly) for £400 to an enthusiast from Liverpool - he was going to restore the body work a little bit, and have it 'coachpainted' (in the original colours). I ended up with an "old man's" Rover 2000 - a dreadful sober letdown after the wonderful Lotus! I often wonder if it is still going - last time I saw one at a car show, the asking price was £13,000 - yes thousand!!!! I should have hung on to the investment - or should I? These days my love is the VW mk2 Golf gti - and a Harley.